i just did the update with the 73d Firmware. Hi Rick54. Thank you for testing the beta version. Everything is working well with the inverter but it seems that the remote display is still displaying the old menu (i.e. : no 38 option or old names ...) but the inverter (in my cave...) is displaying the good menu and view. Did i do something wrong ? Do i need to refresh the inverter ? No. You did nothing wrong, and don't need to refresh the inverter. Unfortunately, this is totally expected. The remote display, like the WatchPower software, merely sends serial commands (such as QPIGS and QPIRI) to the inverter, to obtain the values it displays. It has its own firmware that determines how it displays this information, which we are unable to change. I think as well that my WatchPower software is too old compare to the new software(Ver1.10.sp2). Is there a place to find an earlier one ? Best would be to keep your 4860 MPPT working. Also will you be using the 230V version? Thank you for your answer. So i will play with that old menu. I tried the new menu and it's very good. I noticed that there is 3 options now in the menu 4 "Power Saving" : Sds / SEn and "nor" : after the update my inverter was on nor and i changed it back to Sds(was the setting prior update). What is "nor" used for ? I didn't see it in the Manual or in the AussieView manual. I will take you a picture if needed. "nor" is present in the unpatched (i.e. manufacturer's) 73.00 firmware, but is not mentioned in the manufacturer's manual. The above information is based on painstaking investigation by Coulomb. Neither Coulomb nor I can see any point in having the "nor" option, except that maybe turning on a very heavy load might make the AC voltage sag less, and hence lights flicker less. We haven't tested this. My 5048 pwm scc board has finaly turned up. No instruction or guidance. Just aswell i am used to doing these electronic things. Any way its installed and i will connect it up to test later. Heres hoping they got it right. On another note I noticed that the battery leads that are inside the case were corroded, this inverter was made 6/2017, installed 1/2018. Operating for 7 months, waiting for scc for 3 months.. This is installed in a lock up garage, so how long are they going to last? Is there any conformal coating on the PIPs PCBs? I am concerned about condensation if the temp is to low. Yes, there is conformal coating on the PIP PCBs. Can I start and stop the Pip inverting 230v remotely? And still charge the batteries? If I can, i will hook up a small heater and preheat the main cabin before arrival winter time. Yes, with Coulomb's and my latest patched firmware, you can stop the PIP inverting remotely, and it will still charge the batteries. See the section on "Dynamic Load Control" in this manual. Paul, I have tested recent PIPs and I find they will still charge the battery from either solar or AC, even when the switch at the bottom of the inverter is turned off. This switch is purely a load switch. Sure, if there is no AC or solar available, it will shut down completely, but it will wake up again the next morning when the sun comes up, to charge the battery. Paul are you sure about that? 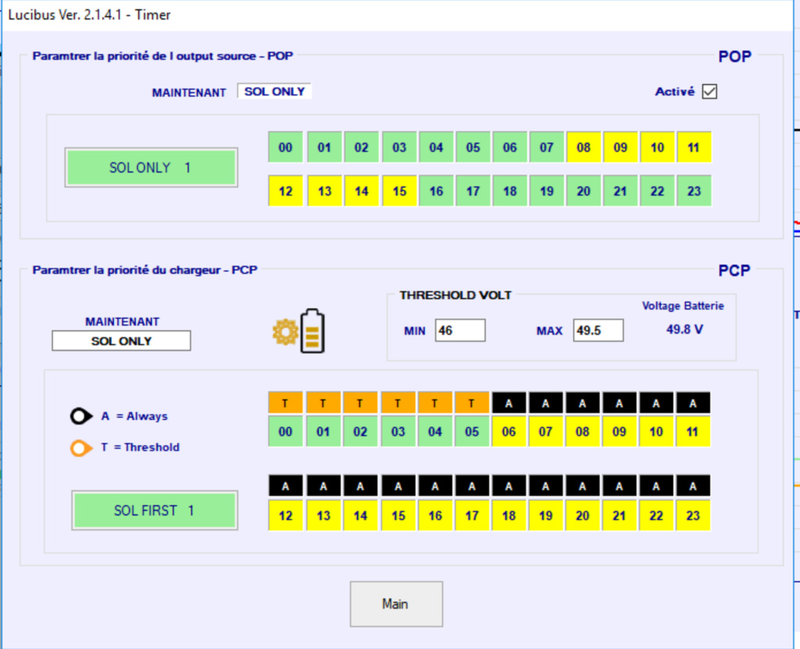 With My pair of PIP4048HS i switch the second inverter off every day and the solar side works seperate to the AC inverter side, Same with the Pip3024HS i have in the Caravan the solar wakes up with sun and shuts down at dusk with the AC switched Off. Iv mailed with mppsolar and i am going to order the new PIP-MK SERIES 5048MK. They will hit the stores in desember. Hope it fits in my backpack, otherwise i have to borrow a snowmobile. Winter is coming! I also have an HLK-RM04 in the mail, that will be a fun project. In case you were planning to rely on any of the features of our patched firmware, such as the ability to remotely disconnect and reconnect the loads, I note that this patched firmware is not available for the PIP-5048MK. But it is available for the PIP-5048MS (with 64 V option). Well no compllaint, easy install worked fine. One thing that I noticed was pwm on 2s 60 cell was putting out about 40 amps. The mppt inverter was only doing about 25 amps on the same 3kw panels. 2s is not enough, and, even worse when it was near 40 C here this week. So next task is to reconfigure to 3s. After one week of try of the last 73 version i found no issue. I'm located on the other side of the earth for you all (Europe). You are always talking about a lot of watts resulting from your panels and i m a bit jealous. I wish i could have more sun there. As a matter of fact, what software do you use to manage your system and to adapt it depending of the sun / the amps request / temperature / ... ? For my part i use Lucibus (https://www.lucibus.com/web/en/) I found this link from an old one at page 1 of this post. 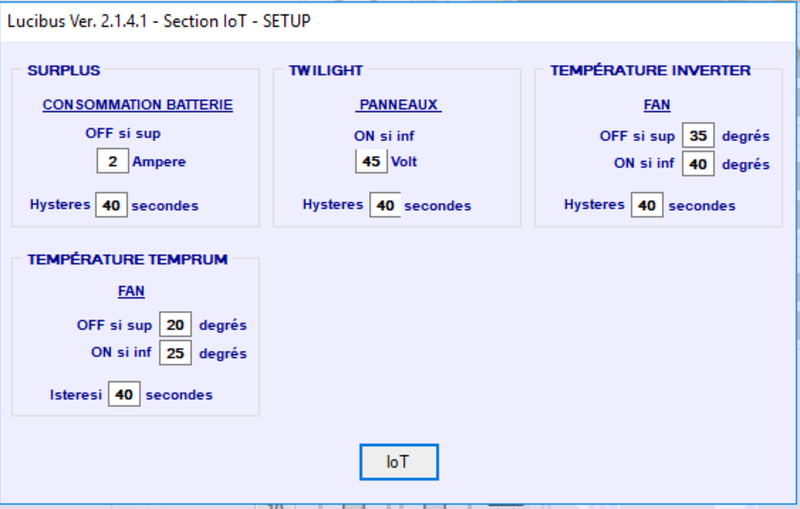 This software can adapt the setting of the inverter in accordance with batterie level to avoid to stress too much the batteries and have them died after 2 years. You can have SonOff systems working with it and set an load shedding if voltage drop below your desired value. You can link to a bmv702. Fottosetore (the guy that made it) add as well an Android or iPhone App to monitor the system and send you email if something is happening to your system. The last thing, Fotosettore did a cube thing : https://www.lucibus.com/cubus to monitor in your house what your inverters are doing. I search a long time on the net for many software and i only found this one with all those options. If you have other suggestions for software i will take it. HI everyone, I'm new here. I have a EASunPower Inverter which is listed as an 812LV-MS model. It is low voltage at 120/110 V and has only a USB port. What information here is relevant to my inverter? I want to control it using a raspberry pi, but can't figure out what info is relevant to me. What do I do to communicate with this inverter? Thank you. What do I do to communicate with this inverter? 812LV-MS is a part number for a MPPSolar branded inverter manufactured by Voltronic Power. I'll assume that your inverter is a genuine but rebadged Voltronic Power model, and not a knock-off / clone. WatchPower control software (it probably came with your inverter) presumably knows how to talk to your inverter over the USB port. My understanding is that it's not as simple as talking to it via a virtual serial port, as I would have expected. For whatever reason, the way to talk to it isn't documented, and those few that have figured it out don't seem to want to share how it's done. WatchPower is a Java program, so it can be disassembled pretty well, if you have the patience. Presumably, buried in there must be the secret to how it's done. Then you'll need to adapt those techniques to a Raspberry Pi. Once you have figured out how to talk to it, you just need to know the commands to send it, and the responses to expect. See the 5 kVA 230 V model protocol manuals for details. I expect that most of the main commands would be supported by the low voltage models. Good luck. Please post details if you figure out the connection details. I wish that the news was better. For whatever reason, the way to talk to it isn't documented, and those few that have figured it out don't seem to want to share how it's done. Hi Guys, i need your help. I have 3 inverters 5KVA-48-PAR A with only one MPPT each (i think similar with Axpert MKS 5K) in three phase configuratin.A very long time ago i did an upgrade with your firmware Pb1 72.70b ( for lead acid) and until now worked perfect. Today I bought 3 new batteries to replace my 16 lead batteries. This batteries are Pylontech US2000 Plus (and is written on the box lithium ion battery).What should i do ? What firmware to use and what setting i should put in Watchpower because in the batt instructions is written charge voltage between 52.5-54V max current 25 per batt, because i saw on the net instructions just to level absorb and float level to 53.2V and that is all ( not to say that the book is almost useless . Please help me to do this setup. Ideally, you would use 25 A for maximum charge current (setting 2) for your 3 inverters, assuming that each one has equal PV connected. But the nearest choices are 20 and 30 A. You could use 20A on 2 and 30 A on whichever inverter (if any) has the best solar. That totals 70 A, which is under the 3x25=75 A limit. I would set float (setting 27) at 50.3 V. It's not a good idea to leave the battery at a high voltage all afternoon. It only makes a very slight difference to SOC to do this. I would also consider reducing the absorb (CV) voltage (setting 26) to something closer to 52.5 V [ Edit: was 51.8 V ]. Again, there is little SOC difference to using 53.2 V, and it's a little kinder on the cells. But maybe they need a higher voltage for bypassing. I prefer not to use much grid charging, so I'd use 50 V for the return to battery voltage (setting 13). You need to use the lithium ferrous phosphate (LFP) variant of the latest patched firmware for PF0.8 machines. You will find a link to that in the Firmware section of the index page. At present that's either release version LF1_73.00c or beta version BF1_73.00d. Thank you ! in this morning (because is morning in Romania) i will start the setup and we will see how il works. Note: This firmware is only suitable for the 48 V models with 5kW/5kVA (PF1) and the 64 V maximum battery voltage option. It is not suitable for the older models with a PF0.8 rating (4 kW/5 kVA), nor is it suitable for the newer PF1 models if they don't have the optional 64 V hardware. Which transistors should I replace? Unfortunately no. For starters, you would need to upgrade DC bus capacitors as well as transistors, on both the battery bus and the 400 V inverter bus. And it is possible that, in the models that are designed to operate up to 64 V, the high-frequency transformer has a lower turns ratio (say 7.5:1 instead of 8:1). Also, there may be a different voltage-divider ratio used to sense the battery voltage. 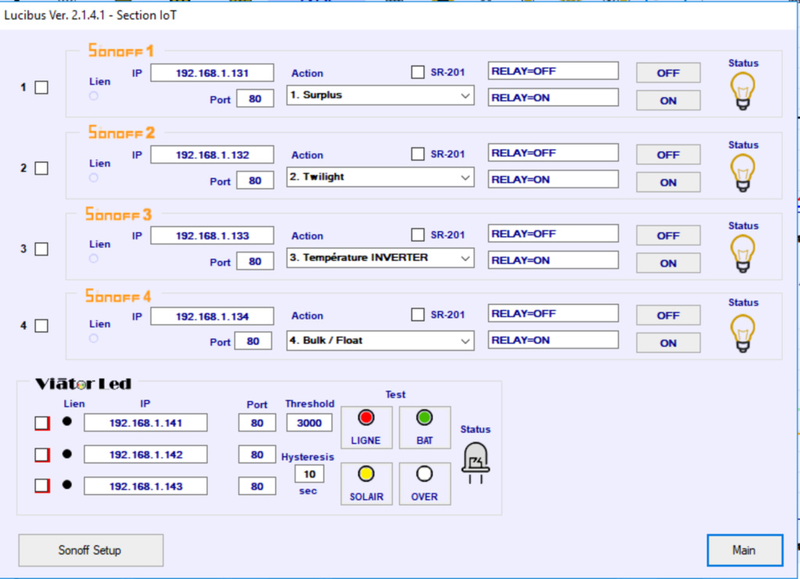 Also, the bootstrap loader and reflash software are designed to not allow 64 V firmware to be loaded into non-64 V machines. But I note that it is simply aimed at improving the robustness of the 58.4 V models, not upgrading them to 64 V.
After reading a lot, I've changed the plan .... What do you think? Solar tracking will be off when i am not present. The primary usage for the 230v ac is the incinerating toilet, refrigerator, oven fan and the oven exhaust fan. I want to expand my system to be able to pre heat the cottage, when i can afford more batteries. Last edited by erland82 on Mon, 19 Nov 2018, 14:35, edited 1 time in total. 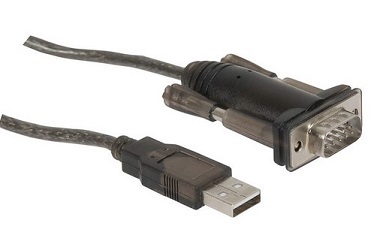 I know the PIP has a USB socket, but it is very difficult to communicate via that. It appears to the PC as a raw HID device, not a COM port. Much easier to communicate via the PIP's RS232 socket (an RJ45) and the supplied RJ45 to DE9 cable. I'm also having Error 51 issues, very similar to Savage1ZA. I have two 4048-MS units in parallel (manufactured 2015) running factory 52.3/01.24 firmware. 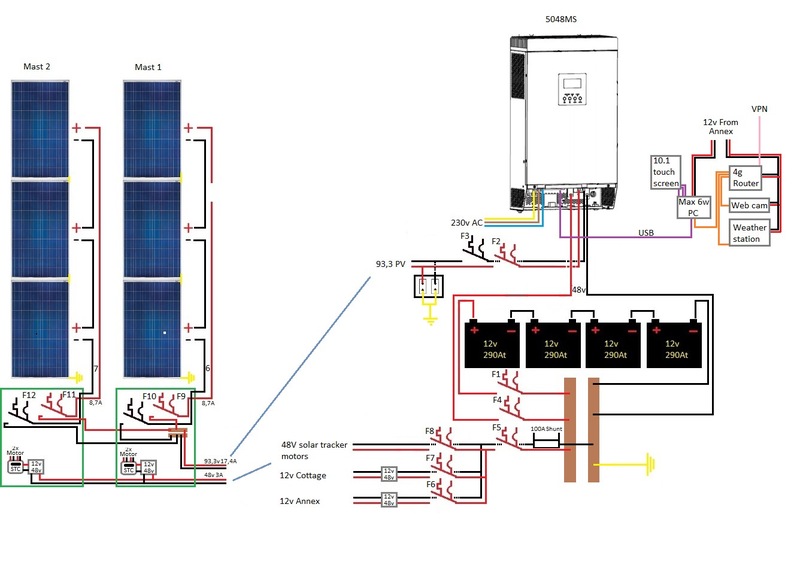 PV array is 4500W split between the two units. There is no grid connection (except for a standby generator). I thought I might share the symptoms with you all. They ran flawlessly for several years, then one started failing daily with Error 51. After a restart it runs fine for an hour or so, then fails again. This is ALWAYS in the afternoon, when they are idling away on float with practically no load, maybe 100-250W. Also, like Savage1ZA, it NEVER fails after the sun goes down, but it has failed in the afternoon, even when the PV array is isolated. It doesn't appear to be a heat issue, they're always only just warm to the touch, top and bottom. I suspected perhaps a dirty load could be causing this grief, so I followed coulomb's suggestion and replaced to two MOVs on the inverter output with his recommended replacements today, but to no avail, same symptoms this afternoon. Hope this may help to shed some light on this rather nasty error. I'm also having Error 51 issues, very similar to Savage1ZA. I have two 4048-MS units in parallel (manufactured 2015) running factory 52.3/01.24 firmware. Please check for a Private Message, and @Savage1ZA also. Coulomb and I have been working on a set of firmware patches to address the "kettle cut-off" or "premature source switching" problem. We had a major setback when we bricked one of monkeytom's inverters in the process (a new one is on its way to him). But as of today, I am testing the first working non-bricking development version (YF1_73.00e). Hoorah! But there are some aspects of it that I'd like to run past you gentlemen. First, we can't decide what to call this feature, KettleKomp™ or AussieBrew™. Second, we're not sure how well it is going to work on all the many and varied PIP-4048 and PIP-5048 systems out there. The math-challenged can skip the fine print below. guestimated_internal_resistance = k * (absorb_voltage_setting - float_voltage_setting) / max_total_charge_current_setting. where k is a constant. I tried k = 1 and it was too low, at least for my system. I'm now trying k = 2. When there are parallel or phased machines, battery_current and max_total_charge_current_setting are summed over all machines. We're trying to avoid having to provide a user interface to allow setting the internal resistance, as this would be very difficult. This formula is based on the idea that at least some part of the difference between absorb and float voltage settings is due to the internal resistance of the battery causing voltage rise at the maximum charging current. We're asking PIP owners to help us by telling us how many volts (including tenths of a volt) your battery sags by, when you turn on your kettle (or other heavy load); what battery current your kettle draws; and what your values are for settings ,  and  (the latter summed over all machines). Some data from my PIP - I use 32x 100Ah LifePo4 configured 16S2P to get 48V nominal. Few samples (Ubat, Ibat) , where is shown step no discharge (or low) followed by high discharge current. I can put more data in file attachment, but I don't know how to append attachment here. Last edited by weber on Wed, 21 Nov 2018, 17:44, edited 2 times in total. Reason: Need to keep these small. One representative step in discharge is sufficient. Thanks DanoP.